My family loves these wonderful German Beef Roulades. We call them King of Meats! Every major event in our family, calls for the preparation of King of Meats and German Creamed Spinach. This was a very hard recipe for me to try and write down, as we just buy the ingredients and put it together – the more steak you buy, the more other ingredients you will need. The original German Beef Rouladen recipe is from my children’s Grandmother, Gertrude Zemp. This is how she taught me to make rouladens. Roulades are also know as Rinderrouladen and German beef rolls. I have had readers say that this recipe is not a true German Rouladen because there are no dill pickles in it. Well, Gertrude learned to make rouladens from her mother in Germany. Just like in the United States, different regions of Germany have their own variations of roulades. Please check out my family’s German Rouladen Dinner Menu (includes recipes). As you can see from this photo, our family really loves these Beef Rouladens. I always have to make a very large batch for the family. Unfortunately they do look like burned turds when cooked, but regardless of the look, they taste like heaven! 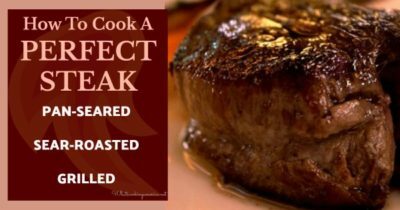 * You can also substitute flank steak. Season each steak strip with salt and pepper. Put a little chopped onion and 1/4 bacon slice onto the top of each steak strip. To make rouladen, roll up (jelly-roll style) and tie well with cooking string. NOTE: Cooking string can be found in most supermarkets. In a large frying pan over medium-high heat, heat vegetable oil. Add a rouladens and brown thoroughly on all sides, turning as necessary. As each roulade is browned, remove from frying pan and transfer onto a large plate. When all the rouladens are browned and removed from the pan, add wine to the pan drippings and let simmer 1 minute (scraping up any browned bits on the bottom of the pan into the wine). In a large heavy baking pot or Dutch oven, place the rouladens and cover with the wine mixture; add water to just cover the rouladens. Simmer gently 2 hours or until tender. When I am make an extremely large batch or rouladen (which is most of the time), I bake them in the oven, covered with the wine mixture, until done. Bake at 350 degrees F. for approximately 2 1/2 hours or until tender when pierced with a fork. When done, remove from heat and let cool. When cool, remove all the strings and place the roulades back into the wine mixture. At this point, refrigerate the rouladen in the wine mixture. This is an important step, as the rouladens gain more flavor if left sitting in the liquid for one day. When ready to serve, place the rouladens, with the liquid, back in the oven or on the stove. Using medium to medium low heat, gently reheat the rouladens. Once heated and ready to serve, remove the rouladens from the liquid and place on a large platter. Make the gravy: Add enough flour to thicken. Cook over medium heat, stirring constantly, until the mixture is thickened and bubbly, about 10 to 15 minutes. Season to taste with additional salt and pepper. Remove gravy from heat and transfer into a large serving bowl. Serve with the rouladens and enjoy! My German grandmother came to USA in the early 1930s (with 5 children, and a 6th, my dad, born soon after arrival). She made the rouladen exactly like this, without the pickles and mustard. We had it regularly, and also every Christmas and sometimes New Years. We served it with red cabbage, potato balls (with a homemade breadcrumb or two in the middle), and usually cucumber salad. I am making it all on Saturday. She also made the best hamburgers! She added onions (or onion soup mix?) and bread. I wish I had that recipe, they were the best hamburgers in the world! And she made an apple crisp/ kutchen dessert too. I don’t know what it was, but I have made many apple desserts and none compared to hers. This is the way my Polish/German grandma made them. She was born in Posnan. Still the way I make them and you hit it right on when you said they are better the next day. Making a batch tomorrow for our New Years eve dinner. My family always made it on the stove – I was so thankful for finding your recipe with adjustments for making large batches in the oven!! Thank you so much for sharing this! Now we can enjoy so much more! Can you tell me roughly how long it takes to rewarm them in the oven, and what temperature you use? I would be interested in knowing where all of the people who make rouladen without mustard and pickles decend from (region/area of Germany). I have my great-grandmother’s recipe as it was made for our family and taught to me as a child. My family has savored this recipe for years. My great-grandmother did not use mustard or pickles. It wasn’t until I was an adult that I learned some German recipes use those items in rouladen. My great-grandparents came to America from Cassel in 1923. My Grandma Gertie was born in Hamburg, Germany and she taught us to make rouladen without mustard and pickles. We just use salt, pepper, onion and bacon pieces in middle. My grandmother Emma Wulf was born in Eutin, Schleswig-Holstein, and her husband was born in Hamburg. They left for America the day after their wedding in 1900. She never used pickles or mustard, and just like Grandma Gertie, she only put onions, bacon, salt and pepper in the middle. Oh such wonderful memories are associated with this recipe! I haven’t made it years, but my daughter asked me just a few days ago what recipes I remembered from my grandma, and that is why I am on this website, looking for rouladen recipes. Grandma never wrote recipes down. My mother was from Freiburg area and immigranted in the early 50’s to Canada. I still make the rolladen recipe she used. Inside round sliced thinly at the butcher, pound it out, apply dijon mustard. Fry up onions bacon and mushrooms , strain and scoup some on the meat. Use string to tie them up, brown the roladen, add red wine, beef bouillion cubes, montreal steak spice, water. Bake in clay pot for a couple of hour. , Make this for xmas with red cabbage, mashed potatoes, Rye Bread, salad !